With all of the yummy scrummy food that I’ve consumed over Christmas I’ve started to feel bad about the effect of my diet on Rabbit. It’s not that I haven’t been eating any fruit or veg, it’s just that the fruit and veg I have eaten has been doused in creams and sauces and has been accompanied by a lot of fatty and sugary extras. I’ve also been really rubbish with taking any kind of vitamins and supplements and my water intake has been a bit low. So one of my new years resolutions for 2014 is to eat for Rabbit! It’s probably the only resolution that I’ll actually stick to as it’s for Rabbit and not myself, so let’s see how it goes! 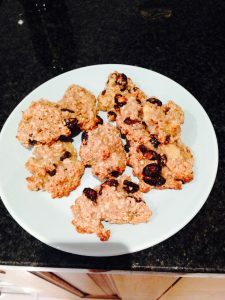 I took to my favourite source for inspiration – good old Pinterest and found a quick, easy and healthy pregnancy snack to make from home – Oaty bites. I then added some cinnamon for a bit of extra flavour and had a banana that was due to go brown so thought i’d pop that in too! I didn’t bother with measurements as I never stick to them and this is one of those recipes that you really can’t go wrong with. As long as there’s enough honey to make the ingredients stick together, and there isn’t an overpowering amount of anything else, your’e pretty much good to go! 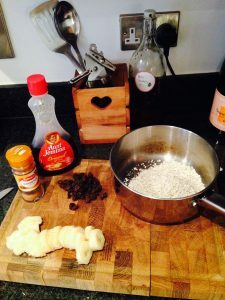 Mix all the ingredients together in a bowl, separate the mixture into whatever size you’d like onto a baking tray – I made mine relatively small so that they’d be more of a small snack then a filling one. 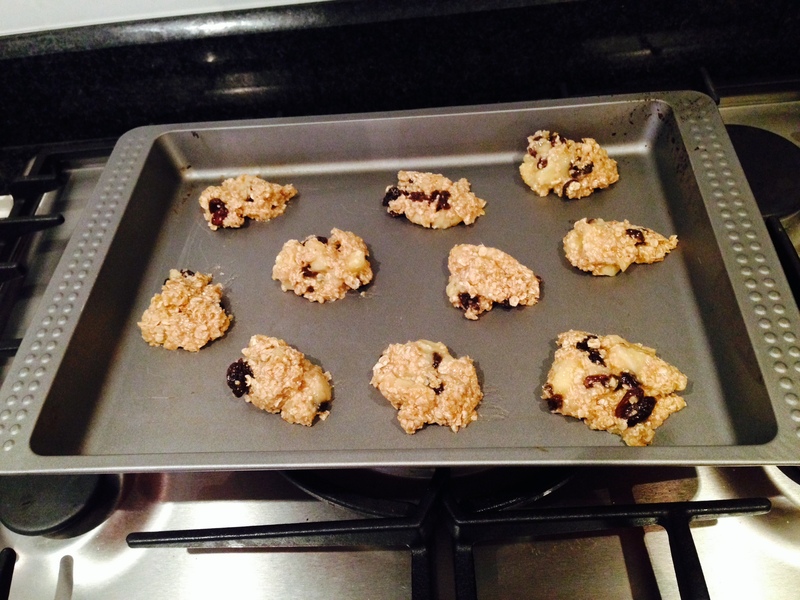 Pop them in the oven on around 200 degrees for 10-15 minutes and either eat warm or let cool! I found that putting them in the freezer made them really great and refreshing, plus they last longer that way! So there yo have it, simple easy and full of energy – perfect for a pregnancy snack!